as 'Manati' so I presume this is in the region of Florida. "Montanus wrote books on church history, theology, the history of the Netherlands, and the peoples and cultures of the New World. His widespread interests and learning were typical of the intellectual flowering of the Netherlands during the Golden Age." 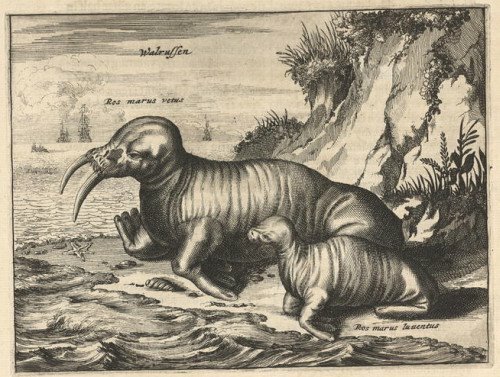 There are myriad engravings in the >800 website pages in which this rare book is displayed. The copperwork was done by Jacob Meurs, an engraver and publisher from Amsterdam. I may be wrong but I sense that there was more than one engraver involved. The shame is that some of the finest illustration work appears in the many very detailed maps which are double page spreads and were digitized page by page. This book contains the best maps of America in the world as at the date of publication - and includes the curious feature of depicting California as an island, an error that was propagated in a number of publications for a century - commencing in ~1625 or so. There are a a sizeable number of illustrations of natives in various places in the Americas, purporting to record customs and culture etc. 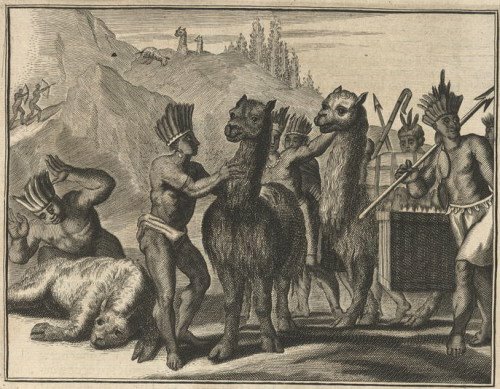 Although it made a contribution to world knowledge about tribe locations, these illustrations (well, all the book images really) are more interesting these days for their eccentricity value rather than their historical accuracy. Needless to say, a book of such exceptional quality at the time was well-received, translated and republished on numerous occasions. 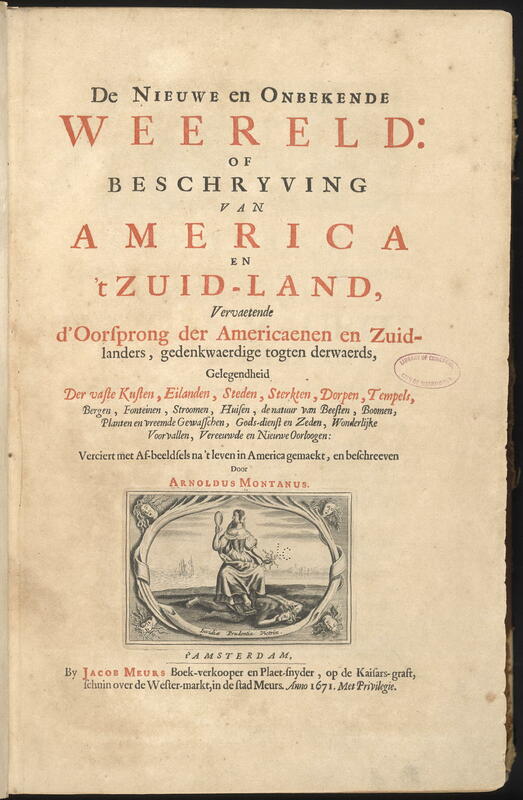 De Nieuwe en onbekende weereld: of Beschryving van America en 't zuid-land is online at the Library of Congress as part of The Atlantic World: America and the Netherlands series. This ebay site will give a quick view of some more images - natives - from a German edition of Montanus's book. I love the title page image - I 'think' it's the publication mark of Meurs (250kb). if there are particular bits that you'd like translated, feel free to ask; i'm quite fluent in dutch (and german). Thanks for the offer piranha but it was more practically to do with background info - there is strangely precious little about Montanus in english on the web. Some things require paper books I guess. I'm just pining for seemless internet translations - it would have been handy while stabbing around through the book. 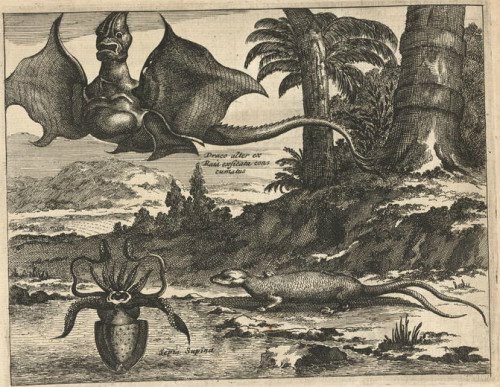 As usual, I am disheartened that all the strange creatures alleged to inhabit the Americas c. 1671 have apparently become extinct, especially the large flying reptile thing that looks like it came straight out of a medieval Last Judgement scene or something. It looks like the sort of thing one would want to stay indoors and avoid. Probably spent its days carrying off full-grown sheep, or llamas or something, to its nest in the Andes or wherever such creatures like to roost. And picked its teeth with village church steeples. 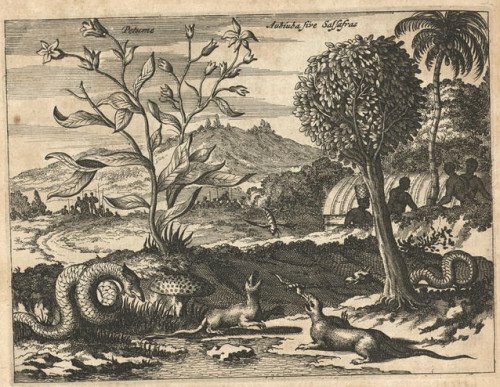 "This is the first edition of the greatest illustrated book on America of the seventeenth century. Lavishly illustrated with maps, views, depictions of native customs, and lush images of indigenous flora and fauna, this work by Montanus stands as one of the true landmark works of Americana. 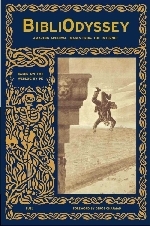 It formed the basis for John Ogilby’s famous America published later in the same year. 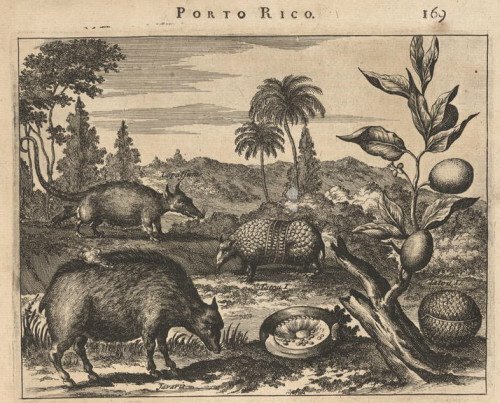 “The finely executed engravings of this work are especially brilliant in this, the original edition” -- Church. 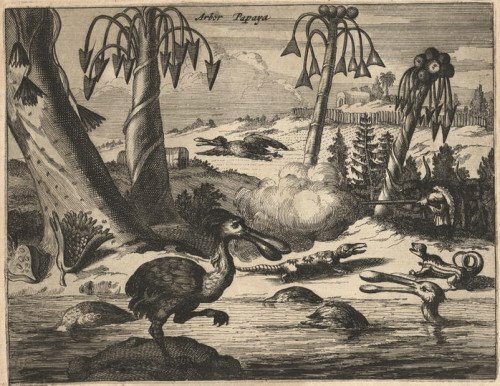 Of great significance is an engraving at the top of page 124, which is one of the first views of New York, Novum Asterodamum. It depicts the settlement at about 1650, and according to Stokes, was probably drawn by Augustine Herrman. 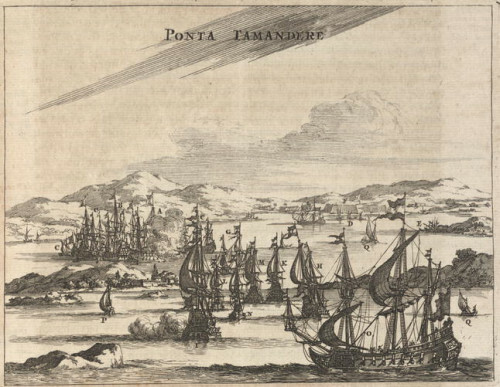 Among the beautifully engraved double-page views of forts and cities are Mexico City, Florida’s Pagus Hispanorum, and Havana. 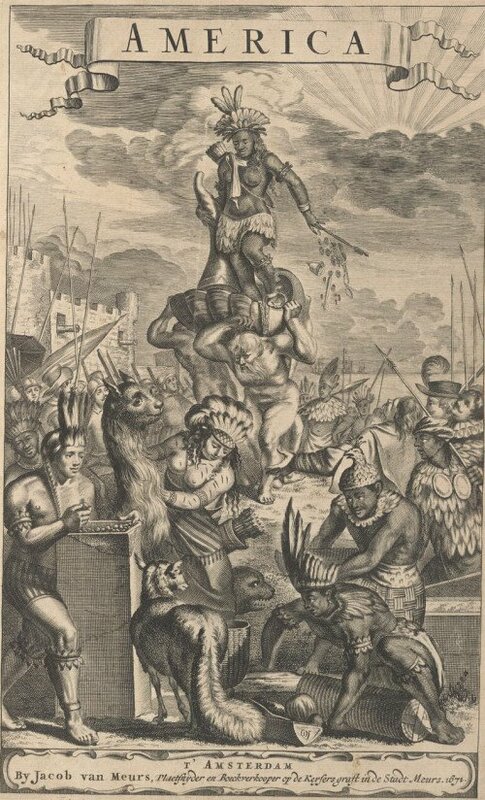 Portraits include Columbus, Magellan and Pizzarro, while seventy plates represent the games, battles, religious rites, cannibalism, habitations, manners and customs of the Native Americans. The text is taken from many sources and cited on a leaf at the end (New York, for example, is taken from Van der Donck). There is a section on California and an extended description of Brazil." 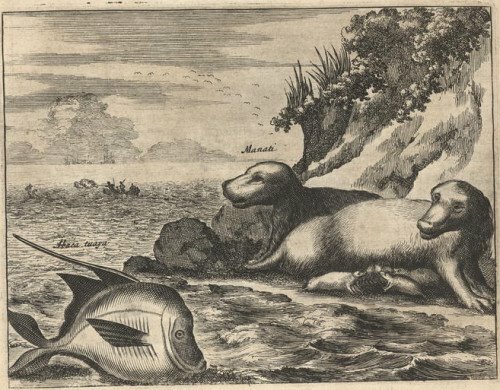 All the illustrations are much more easily accessible (versus L o C) from NYPL. they are known as canibals....my question....my ancesters didn´t knew anything about metals, so how it is posible that my people where cutting body parts with knifs and I don´t know what....In every pictures that where painted from portugisians, Tupinambas have any kind of knifs cuting body parts...... Ding Dong!!! iztaccihuatl30, thanks. 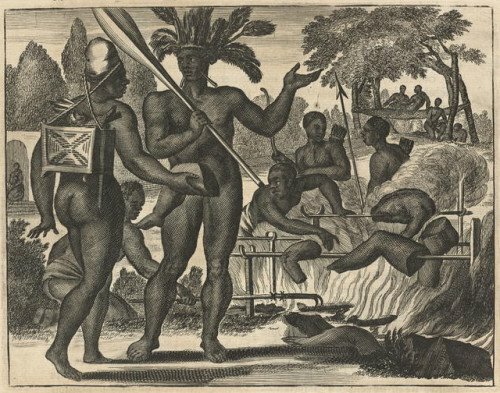 The pictures I've seen are made by westerners AFTER Europeans arrived in South America (after ~1500) I think. So *if* they really had metal knives, they probably got them from trading, swapping etc with the foreign expeditions. But I am no expert at all. One thing though, even if they didn't have metal pre-1500, they will have had sharpened stones and axes and sharpened wood pieces to cut up animals for food, surely.